I think that we all know now that I have a healthy obsession with blazers so this outfit includes none other than a blazer. Not just any blazer though, this is a longline Calvin Klein blazer. I typically stick to economically priced items because that is how I really shop in my everyday life but this was definitely worth the splurge. The color, length and fabric completely sold me. Because I am very shapely in the hip area, longer blazers help to conceal some of that width when wearing form fitting garments underneath. I also love that its made of a lightweight material that doesn’t look too corporate-like and can be worn casually. Although this outfit is “matchy-matchy”, it works because the colors are not competing with one another. The simplicity allows them both to exist collectively. If you are not comfortable with a crop top, you can easily swap that out for a tank top and a pencil skirt or skinny or boyfriend jeans and still achieve a great look. There are so many different variations that you can come up with to make it your own! 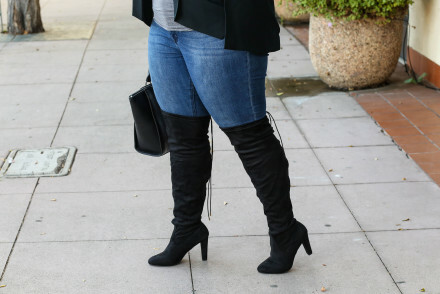 Hi, I’m confused, are these not plus size items? I adore your style, beautiful as always!!! What a great Post…this look of Yours is very COOL!…Super Mega COOL! !